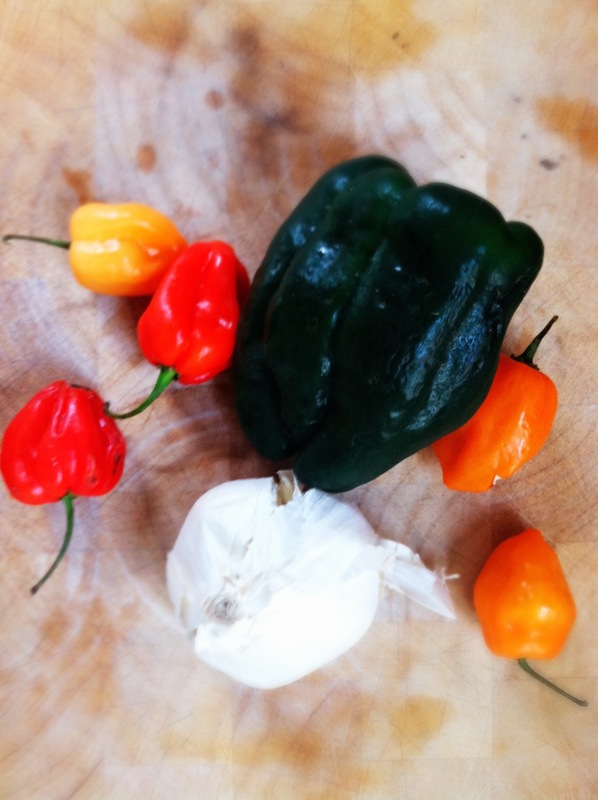 One of my classic family stories involves hot sauce. 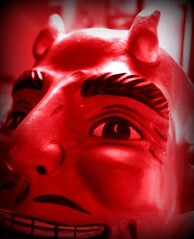 Years ago, my Uncle Al told my innocent, unsuspecting, 7-year-old sister to try some “delicious” salsa. What he didn’t tell her was that the salsa had warning labels on it because it was so spicy. My sis took a big slosh of the stuff onto her chip and ate it down, and then her entire body turned bright red. She ended up garbling milk, the white liquid dribbling off her tongue and onto the floor because it was so hot. My uncle had himself a laugh over it, whereas my sister and I lost a bit of respect for him that day. In the last year or two, I heard my uncle recount the story, and he blamed his own daughter for feeding my sister the sauce. So, I think he has a guilty conscience over the incident, too. The following sauce could have a similar effect if put into the wrong hands. I advise you to eat it and offer it with care. You want to wear gloves to protect the skin of your hands while you remove the stems and seeds, and finely dice your peppers, and certainly make sure not to wipe your eyes when handling them, or you will be in pain! Dice the garlic, and mix all the ingredients in a medium bowl. Let the peppers sit in the salt for a few hours to extract their juices. Add 1 t apple cider vinegar. Place the peppers and their brine into a glass jar- mind didn’t produce a ton of their own. Add water so that the peppers are immersed, and cover your jar. Let this sit at room temperature for a month. Skim off any mold that forms on the top. Place your fermented pepper mixture in a food processor, with brine, and macerate until they are a liquidy pulp, place your sauce in a bottle and refrigerate until you are ready to consume. It won’t look like very much sauce– but a little really goes a long way! Finished product– appropriately placed between the kimchi and the yogurt in my fridge. Okay, so this recipe is not a fermentation. 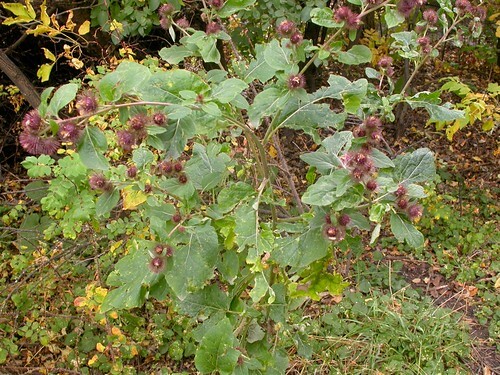 I feel that it’s a worthy addition to this blog’s subject matter though, since I’ve touched so frequently on herbalism. I’ve been curious about the discrepancy between marshmallow the herb and marshmallow candy for some time. Same name, very different thing! A little research will tell you that the original marshmallow candy was, in fact, made with the mucilaginous sap of the marshmallow plant, and the candy was first developed as a kind of ancient variation on the cough drop, since marshmallow herb is soothing to sore throats. The Egyptians combined marshmallow sap with honey, nuts, and grains. The French turned marshmallows into a confection in the 1800s, whipping it into egg whites, much like a merengue. Eventually, marshmallow root was replaced by gelatin because of practical concerns, aka, money. Marshmallow root is much more expensive these days than gelatin. The other thing you will find with modern marshmallows is that they are all made with corn syrup: an ingredient I’d rather avoid. 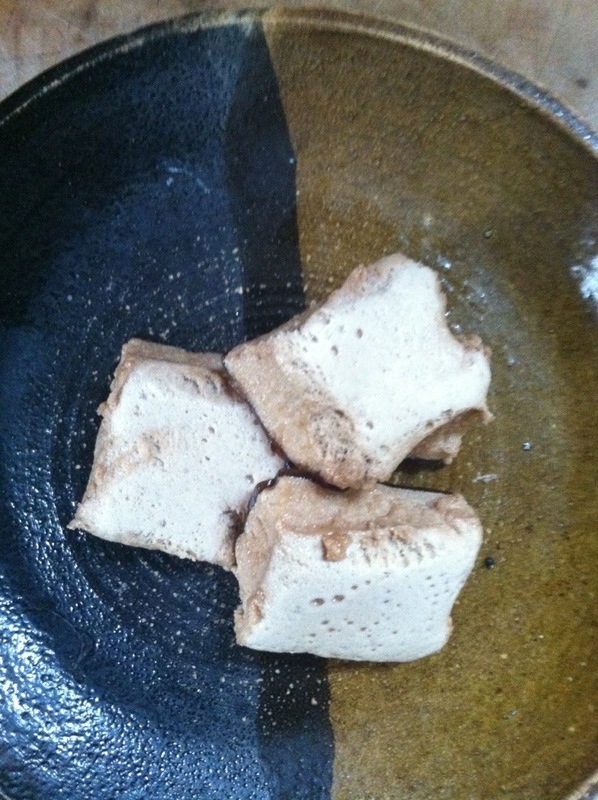 I searched a while to find a marshmallow I’d rather eat, and I came across a recipe at herbmentor.com that combines marshmallow with rose water and honey. This recipe doesn’t use the marshmallow as a binder anymore: gelatin is added to the mix as well. Not having any rose water on hand, I replaced changed the recipe a little and added some rose hips, which I find always go nicely with hibiscus that was already added to these marshmallows. My results were fluffy and a little fruity. Quite good, and very unique! 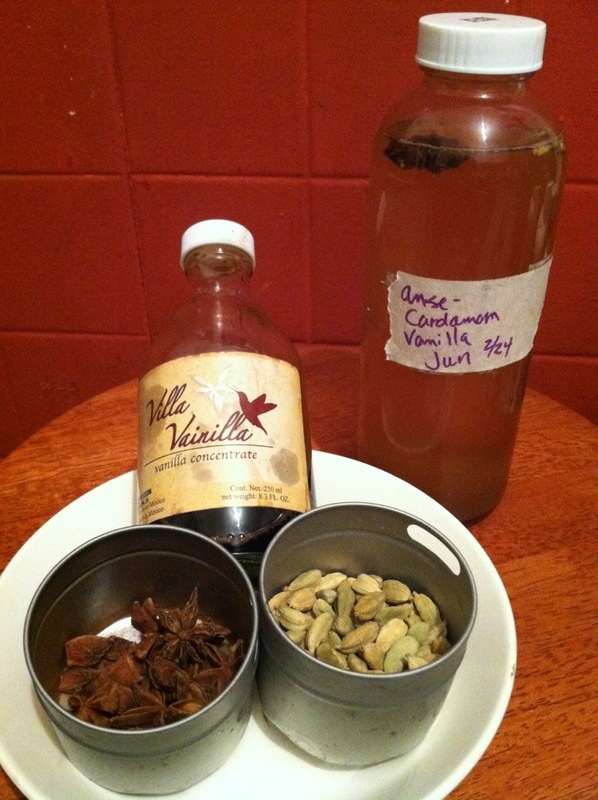 Combine 1 c water with 1 T marshmallow root powder, 1 T dried hibiscus, and 1 T rose hips in a small saucepan. Simmer for 5 minutes, then remove from the heat and let them cool in the fridge. When cool, strain the mixture and add more water so the liquid equals one cup. Take 1/2 cup of your tea concoction and mix with 1 packet of gelatin in a medium bowl. Mix until well dissolved. Put the other half in a small saucepan. Combine with 1 c honey, 1 tsp vanilla, and a pinch of salt. Let simmer, stirring occasionally, until your mixture reaches 230-240 degrees Fahrenheit. This is called the soft-ball temperature in candy-making terms. Use a cooking thermometer to keep track. I found that the temp is hard to keep low enough on my gas range– the mixture kept fizzing over, so you may have to babysit the process quite a bit. A flame spreader might also come in handy to diffuse the heat. This is the tedious part. When your mixture is hot enough, slowly combine it with the gelatin mixture, mixing on low, using a whisk attachment on your mixer or hand-blender. Once they are combined, mix on high for several minutes, until the whole mix is frothy. The color will be brown-pink-creamy. 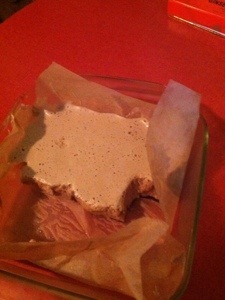 Line an 8×8 pan with oiled parchment paper. Pour your mixture into the pan, and let it set at room temperature. You could also set them in the fridge. I’ve been storing mine in the refrigerator. If the mix didn’t totally emulsify, like mine, then you might end up with a thin glaze of honey on the bottom of your marshmallows. A few days later: Marshmallows half eaten! Marshmallow root is primarily wonderful as a demulcent, meaning that it creates a soothing film over mucus membranes. This makes it useful for conditions like bronchitis, ulcers, or inflammations of the mouth. It can be used on the skin for conditions like boils or abscesses as well. Both the root and the leaf can be used. This Chicken-Chickweed-Chutney sandwich creation was so yummy that I had to share it with more than folks than just my friend Marcy who I had lunch with today– thus this blog post. The sandwich utilizes my cranberry chutney, a recipe which I posted earlier this month. Slice open and lightly toast a breadroll. This recipe should last you for 3-4 sandwiches, unless you are Dagwood. Combine ingredients in a bowl and consume! Whisk ( I recommend using the whisk attachment on a hand blender) 1 large egg yolk with 1 T lemon juice and a dash of salt in a smallish bowl, till smooth. Take 1/2 c olive oil, add by drop-fuls until the mix begins to turn thick and stiffen. After about half of the olive oil is added, you can start to add it in more steadily. Make sure each addition is blended fully before you add more. 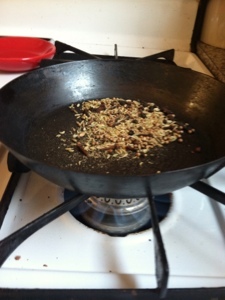 Once the oil has been fully combined, add freshly ground pepper to taste. 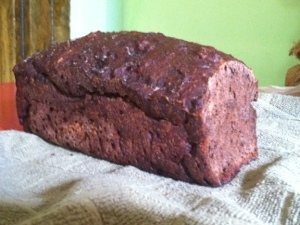 Months ago, I was very excited to read a fellow blogger’s creation of kombucha bread, adapted from a beer bread recipe from the Upslope Brewing Company. I’ve been meaning to try it ever since, and I finally got around to the task yesterday. I made an adaptation of her adaptation: thank you to Tea Foodie for your post! Preheat the oven to 350 degrees, and lightly grease a 9×5″ loaf pan. on top of the loaf. Careful– it will be puffy and the butter can easily drip down the sides of the pan, making a mess. Bake for an additional 10 minutes. Once done, let the bread cool a few minutes before you remove it from the pan. I’m sure this bread would be great hot, but I baked it right before we went out for an enormous Italian dinner. I got a hold of the bread this morning for breakfast, however, and enjoyed it with a slab of Ronnybrook Dairy cinnamon butter on top. The already butter-glazed bread barely needed anything on it, but the additional butter made it extra extravagant. It’s a sweet bread, and the honey comes through strongly. Next time I’d like to add raisins, currants, or nuts before I bake it. I generally think of chutney, the salsa of India, as a summer food, perhaps partly because its origin is a place with a hot climate, and also because it requires fresh fruit which is mostly available in the summer. My adoration of cranberries over the winter made me decide to depart from my plain old cranberry sauce recipe to ferment something new. 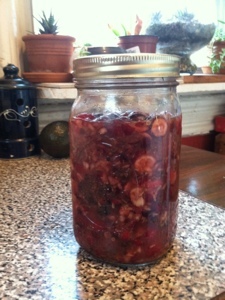 So, here’s a fermented winter chutney I created. To learn more about lacto-fermentation, check out my post on lacto-fermentation basics. Enjoy! Wash 4 c cranberries (usually the amount of 1 bag), and pick out any soft ones. 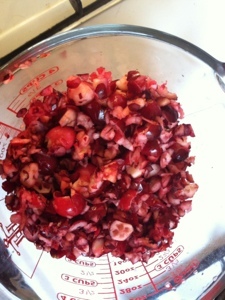 Chop the cranberries coarsely in a food processer. Place your mixture into a quart sized mason jar, and press the cranberries down so that the water rises to the top of the mixture. If necessary, add a little more water. This part is a little tricky, since cranberries like to float. Do your best to immerse everything. By the end of the first day, my cranberries had floated up above the water, but everything came out okay…. Leave at least 1 inch of room at the top of your jar. Seal the jar tightly and leave at room temperature for about 2 days. Test your recipe. If it doesn’t taste done (this is a personal preference thing), leave it a little longer. When ready, refrigerate your chutney. It should keep for about 2 months in the fridge.